Credit: NASA/CXC/Columbia U./C.Scharf et al. A Chandra mosaic of images of the Fornax galaxy cluster reveals that the vast cloud of ten-million-degree Celsius gas surrounding the cluster core has a swept-back cometary shape that extends for more than half a million light years. This geometry suggests that the hot gas cloud is moving through a larger, but less dense cloud of gas, creating a ram pressure, or intergalactic headwind. 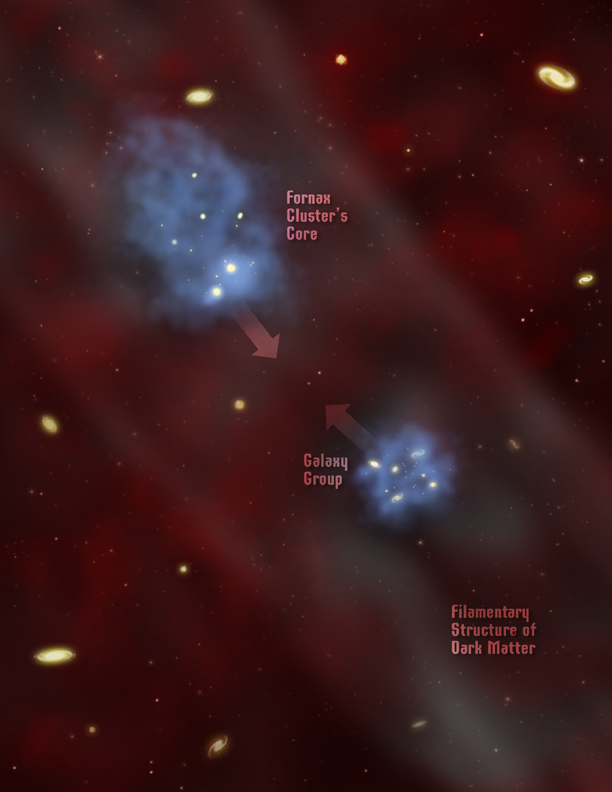 Optical studies of Fornax have identified a large group of galaxies on the outskirts of the cluster that appear to be on a collision course with the cluster core. The motions of this group and the cluster core indicate that they lie along a large, unseen, filamentary structure composed mostly of dark matter that is collapsing and flowing toward a common center of gravity (see the accompanying illustration). Most galaxies, gas, and dark matter in the universe are thought to be concentrated in such structures, and galaxy clusters are believed to form where the structures intersect. When an individual galaxy falls into the core of a cluster, its gas will be swept away by the ram pressure of the hot gas in the cluster. This effect can be seen in action in the Chandra mosaic. The hot gas in the bright elliptical galaxy NGC 1404 -- to the left and below the core of the cluster - has a sharp leading edge and a trailing tail of gas, indicating that gas is being swept from the galaxy as it falls toward the core of the cluster. Over the course of hundreds of millions of years, NGC 1404's orbit will take it through the cluster core several times, most of the gas it contains will be stripped away, and the formation of new stars will cease. In contrast, galaxies such as NGC 1387, the bright galaxy to the right and outside the cluster core, are not being stripped of their gas, and new stars can continue to form. 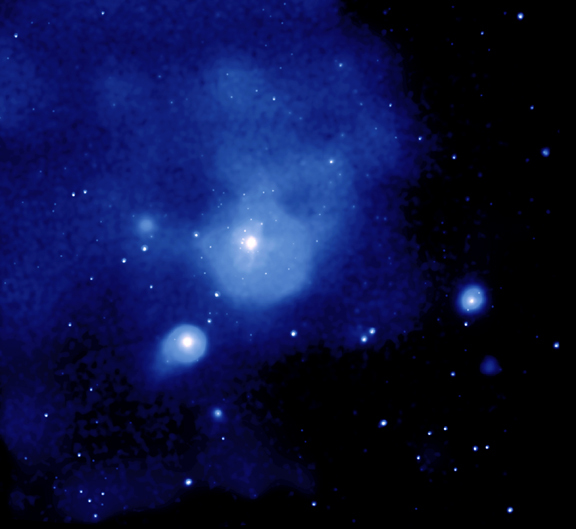 Some of the other bright sources in the X-ray image are galaxies in the cluster, but most of them are due to distant background galaxies with active supermassive black holes. Credit NASA/CXC/Columbia U./C.Scharf et al. Scale Image is 47 arcmin across. Coordinates (J2000) RA 03h 38m 24.30s | Dec -35° 27' 04.80"